Posted February 25, 2019 by Hopkins Carpet One & filed under Tips. We are sure having a cold and snowy winter here in Minnesota! The effects are felt on almost everything: from our bodies to our vehicles to our homes. At Hopkins Carpet One, we especially notice how winter weather affects carpet and flooring. Dirt, small pebbles in slush, water and harsh alkaline residue from ice melting compounds can take a serious toll on floors. So, we want to cover some basic winter floor care tips to help your floors last through the season with as little damage as possible. 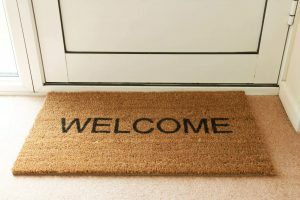 Put extra floor mats or rugs down at all entrances (both inside and out) to keep ice melt compounds and moisture from being tracked onto your floors and carpeting. You may want to go so far as having everyone remove their shoes at the door. The best way to prevent floor damage is to keep the elements that cause the damage from getting on your floors. You will want to regularly clean the floor mats you have at entryways to remove the debris that was tracked in. Once rugs get dirty and/or wet they will not do their job as well. You’ll also want to sweep or mop regularly to clean up any stray dirt or salt. If you get a lot of traffic in your house, this may need to be done daily or even twice a day. You can also protect your entry by cleaning outside. Make sure porches and sidewalks are clear of snow, and once the snow is melted, sweep up any melting compound that remains. Salt is alkaline; dirt is not. Your normal neutral floor cleaner may work great for normal everyday soils, but it will do nothing to remove heavy salt residue. To remove the salt from your floors, you’ll need a neutralizer. A neutralizer takes the alkalinity of the salt and changes it to neutral, allowing it to be rinsed away. Regular upright vacuums don’t work as well to pick up larger particles like salt crystals. A backpack vacuum or attachment may be needed to get those larger pieces. A wet/dry vacuum is also a good idea if the snow is coming down outside and your floors have wet spots. It’s easier than grabbing a mop, and it won’t damage the motor of a regular vacuum. We hope these tips will help you and your floors survive the rest of winter. If you have additional questions on winter floor care or are looking for new flooring in the Twin Cities, don’t hesitate to contact us.